ST. LOUIS, Mo. 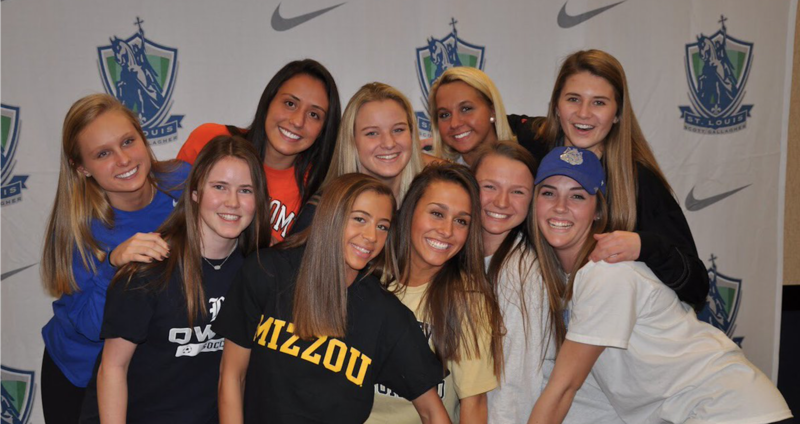 – St. Louis Scott Gallagher caught up with members of the 1999 MO ECNL girls team which recently celebrated nine high school seniors who are continuing their student-athlete careers after committing to colleges on National Signing Day. The class of 2018 was tabbed for greatness at the U15 level when they were the first SLSG team to qualify for the ECNL Champions League National Playoffs. After the birth year changes took effect at U17 level, the girls went undefeated for 25 games going into the ECNL Champions League National Playoffs and won the first Midwest Regional Conference title in 2016. As U18 players, the girls qualified with the 1998 birth year girls for the ECNL National Finals and finished the season ranked 5th in the country. This past year as U19 players, the girls won the Midwest Regional Conference title and finished the season 17-0-0 and will compete in the ECNL National Finals as the #1 seed. Anna Lawler (Oklahoma State University) was one of the girls who went undefeated the season before the birth year rule took effect. “Last year we were undefeated but this season I would say it’s been easier because we had more time together after the birth year change and we feel really comfortable around each other,” said Lawler. In addition to performances on the field, the class of 2018 girls have exceled off the field with their community involvement. Every year since 2015, the girls have completed an Upper90 community service project with organizations such as Marygrove’s Christmas Angels (2015), Food Outreach-St. Louis (2016), North Grand Neighborhood Services (2017), SPENSA (2017) and Missouri Baptist Medical Center (2018). Gaby Smith (Butler University) has been with the club for six years and believes those community projects have helped the team on the field as well. “While at SLSG, I’ve learned to give back to the community and really enjoyed being with my teammates at those community projects,” said Smith. SLSG congratulates the U18/19 ECNL team for the undefeated season and wishes the Class of 2018 all the best as they continue their academic and athletic careers next season.